PEEPS S'mores Bars - A delicious Easter dessert everyone will love! PEEPS S'mores Bars - A delicious Easter dessert everyone will love! What do you get when you combine graham crackers, peanut butter, chocolate, and marshmallow PEEPS? 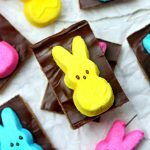 The most delicious PEEPS S’mores Bars and the best Easter dessert recipe! Line a small baking pan with foil and lightly spray with cooking spray. Melt 1/2 cup butter and peanut butter in small sauce pan over medium heat. Once chocolate and peanut butter is melted, add graham crackers and powdered sugar. Mix until well combined. Press dough into baking pan and place in refrigerator for at least 30 minutes. Melt chocolate chips and 2 tablespoons butter in microwave, stirring every 30 seconds, until smooth. Spread chocolate over graham cracker mixture. Add marshmallow PEEPS to bars.